We provide HVAC heating & cooling services for Westland MI 48185 48186 48187. AC repair, furnace repair, furnace replacement, air conditioning sales and service for Westland MI. Proficient Heating & Cooling is a family owned and operated HVAC company serving clients in Westland MI. With over 23 years of experience in ac repair, furnace repair, HVAC repair and other HVAC services, Proficient Heating & Cooling has the expertise, know how and work ethic to satisfy our customers in Westland MI. Not only do we service air conditioning units, furnaces, whole house humidifiers, thermostats and more but we sell some of the best furnaces and air conditioning units available. Proficient Heating and Cooling specializes in residential and commercial heating and cooling system repair and installation. Proficient's team of certified, factory trained HVAC experts can assist you in the sale or service of any heating & cooling system. Proficient Heating & Cooling values their customers in Westland MI and promises honesty, integrity and reliability in our services. Proficient Heating & Cooling is a full service AC repair company. We service all makes and models of central air conditioning units, residential and commercial. We carry a large variety of replacement AC parts and will be able to service your ac unit quickly and efficiently. If we don't carry the correct part for the job we will do our best to locate the correct replacement part and service your ac unit in a timely manner. Getting your ac unit up and running during a hot summer day is our top priority! Let Proficient Heating & Cooling service your central air conditioning unit. You won't be disappointed! Furnace repair and furnace replacement is a core service at Proficient Heating & Cooling. We provide high efficiency furnaces at a very competitive price. Our factory trained service technicians can install your new high efficiency furnace in a very timely manner, thereby saving you time and money. Being a Bryant dealer, Proficient Heating & Cooling can sell you a new furnace for a lower price and install it for you too! You can save money going forward with a new high efficiency Bryant furnace! Older furnaces become less efficient as time goes by. They become less and less efficient. Getting a new, high efficiency furnace will absolutely save you money going forward. Don't let you money just go out the window (or out the exhaust pipe) and get yourself a new, high efficiency furnace from Proficient Heating & Cooling! We promise to beat any price on any new Bryant furnace for all of our customers in Westland, MI. Proficient Heating and Cooling offers exceptional HVAC maintenance and service. Heating systems, central air conditioning units, whole house humidifiers and thermostats, Proficient Heating & Cooling services them all in Westland, MI. In the interest in providing the best customer service in the HVAC industry, we offer HVAC repair maintenance agreements for all of our residential and commercial customers that reside in Westland MI. With our maintenance agreements we can insure that your HVAC systems run smoothly and efficiently for years to come. We put our customers needs first and try to provide 100% satisfaction. We promise to go the extra mile. The heating and cooling systems in your home require regular cleaning and maintenance. To keep them running at peak efficiency, contact Proficient Heating and Cooling today and inquire about our HVAC service agreements. We sell and service most brands of heating and cooling products. Brands such as Bryant, Carrier, Aprilaire, Honeywell, Payne and many more. 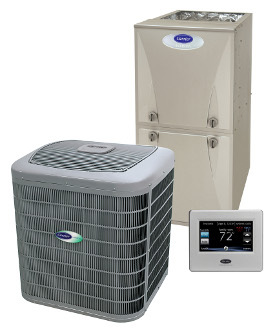 We are a Bryant dealer so we can not only provide a great new furnace or air conditioner unit but we can offer some of the lowest prices in town on these quality heating and cooling products. So if you live in Westland, MI, please call Proficient Heating & Cooling today! You won't be disappointed in our pricing or our HVAC service. We sell high quality, high efficiency new furnaces and ac units. Our prices are very competitive and our installation services are second to none. With over 23 years of experience in the HVAC industry, Proficient Heating & Cooling can provide superior sales and service to all of our clients in the Westland and all of the surrounding areas. See our testimonials page.